Pagoda, Shwedagon Pagoda and Convocation Hall. Being cultural and commercial heart of Myanmar, Yangon is really worth visiting. If you have an ideal of travelling to this pretty city, the first thing you should do is choosing the best time to start your trip to make sure that you will have wonderful days there with nice weather. Yangon has a tropical monsoon climate with a monsoon season and a dry season. The average temperature is above 25 degrees Celsius with the peak at approximately 40 degrees. There are big differences between 2 seasons in terms of temperature and rainfall. Dry season lasts for about 8 months (starts in October and ends in the next following May). During the dry months, there is a little rain. The temperature varies from 20 to 37 degrees so it is quite hot. The peak of hot weather is April with the temperature is rarely under 35 degrees and sometimes reaches to nearly 40 degrees Celsius. 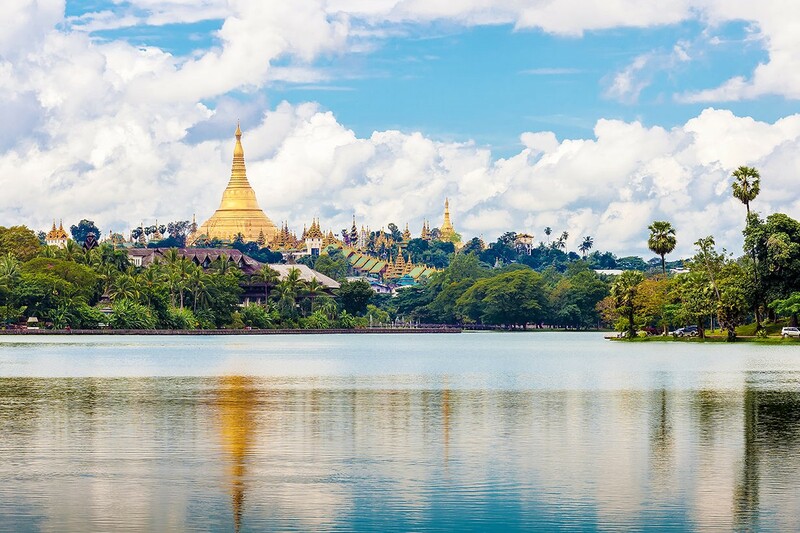 Travelling to Yangon in this time can avoid terrible rain that may spoil your vacation. 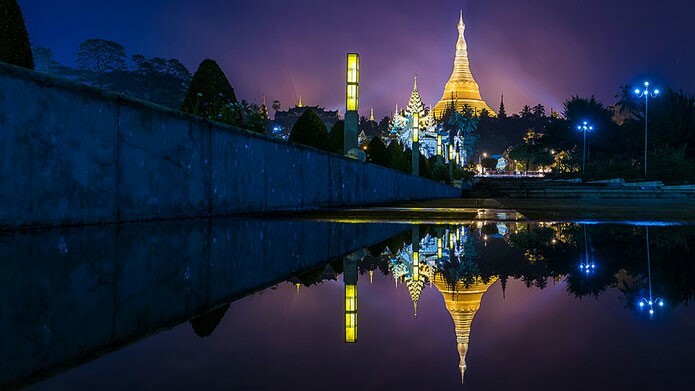 Without rain, it would be so great because you have a chance to take the view of the Golden Sule Pagoda from downtown Yangon at night with the clear sky and billions bright stars. However, sometimes burning days can make you feel uncomfortable and tired. Monsoon season runs from June to September. In these months, it becomes cooler with the average temperature fluctuating around 27 degrees. Rainfall totals are much more higher than that in dry season. Sometimes, it is rainy and wet all day, especially in July and August. Although rain may prevent you from going out when you are enjoying your vacation here, that does not mean that travelling to Yangon in rainy season is a bad idea. First of all, the cool weather at least makes you feel better than having to walk under the boiling sun with burning sensation. You will enjoy feelings of refreshing during these cool days. An other advantage is that you may acquire knowlegde of Buddhist Lent (Vaasa) that begins in Waso month ( usually falling in June or July). 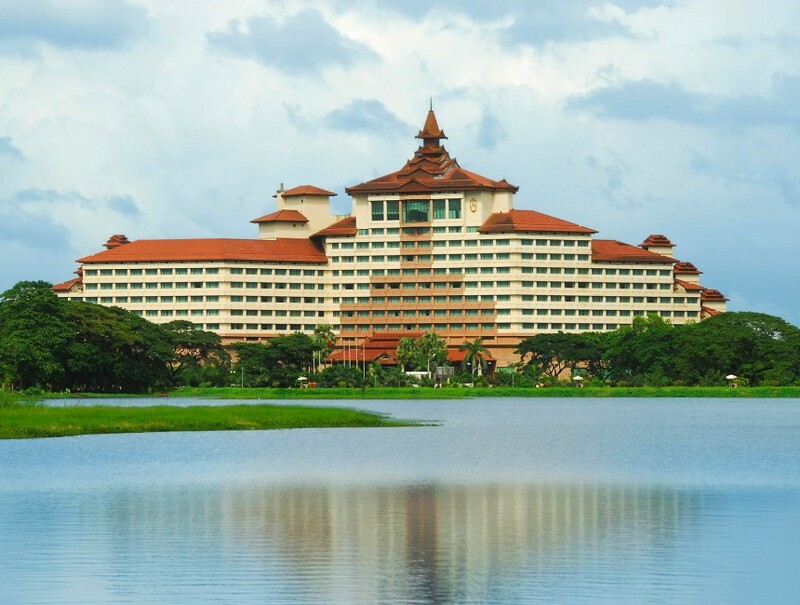 Moreover, a lot of tourists is affraid to visit Yangon in these monsoon months so there is no croud of tourists, you don’t have to worry about the shortage of decent rooms or waiting for a long time at restaurants. Therefore, costs of visiting, booking hotel, transportation are certainly much cheaper. You see, there are also some advantages of going to Yangon this season. 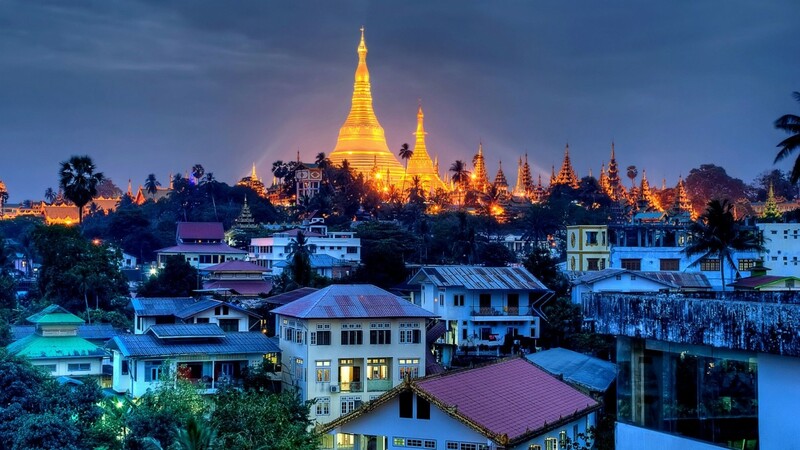 In general, many people say that the months from November to February are the best time to visit Yangon; however, it means that you will not have a comfortable space due to too many tourists. Personally, I’d like to go there in June, the weather is cool and it does not rain too much. You should think carefully before deciding when is the most suitable time for you. 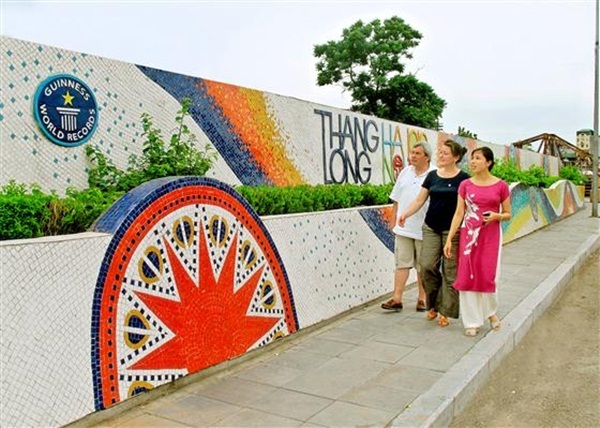 With at least 02 hours at this place, you will have chance to learn more about Vietnamese traditional cultures, marriage customs of different ethnic groups, childbirth as well as family life. 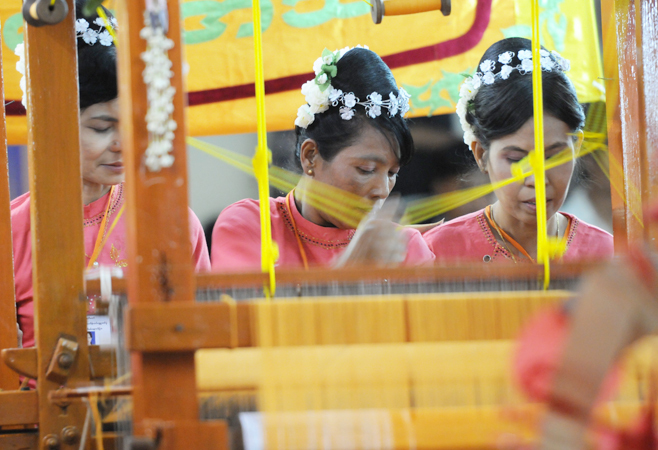 Some are interested in Vietnamese unique traditional women’s clothing while other may deeply impressed by the role of women in the defense of the nation. 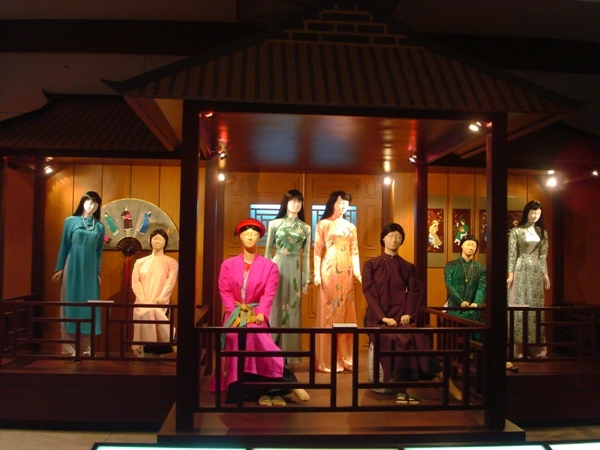 Exhibits are described in Vietnamese, English and also French then it is easy to explore the museum on your own or with your tour guide. 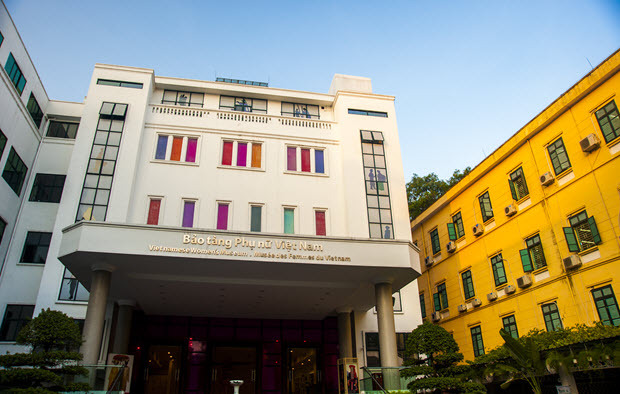 Entrance fee is VND 30,000, all in all this museum is really worth visiting while in Hanoi! Myanmar is a veritable land with full of colorful festivals and special events, mostly cultural and religious, all are always pleasurable. Most festivals are celebrated nation-wide all over the country. As Myanmar traditionally goes by 12 month lunar calendar, the dates of festivals and culture events are determined by the lunar New Year. Once you come and experience the festivals, you will not forget that moment. 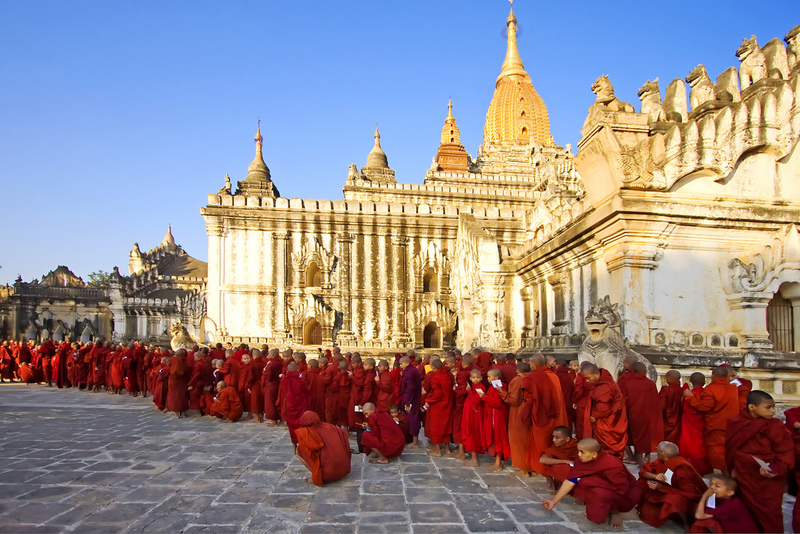 Myanmar also have festivals all around the year, at least one in each month of the year. 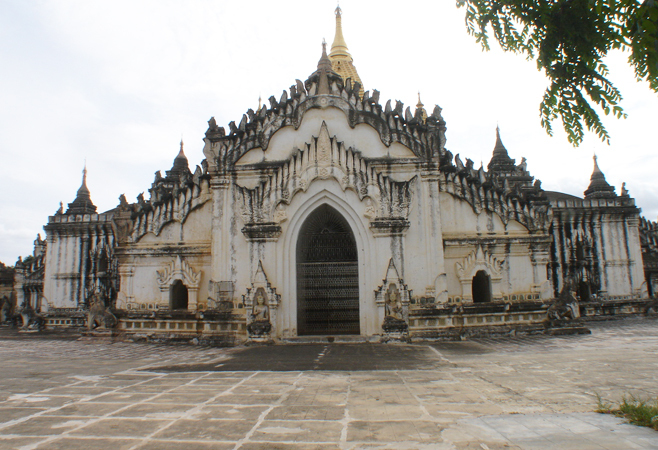 Ananda pagoda is one of the most famous pagodas in Bagan. Built by King Kyansittha of the Bagan dynasty in late 11th century, it is also rated as the most aesthetic and artistic structure in Bagan. The temple’s name means the endless wisdom of Buddha. 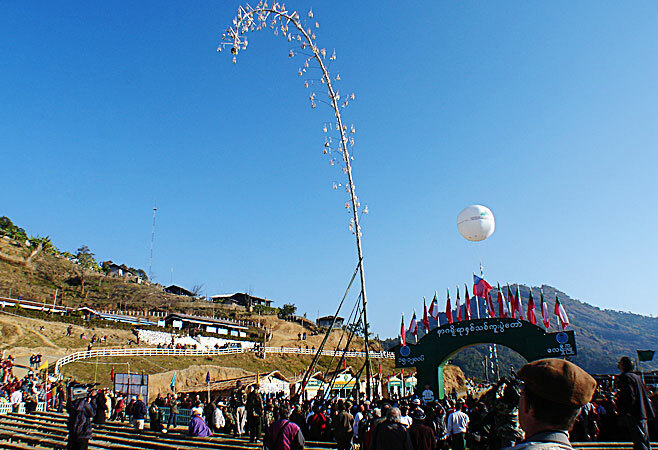 The pagoda festival is held annually on the full moon of Pyatho (January). This annual festival has been around for more than 2,000 years and even now people from surrounding villages come to the festival by the traditional way in bullock carts. They also stay the whole 7 days duration of the event, camping under the spreading acacia trees around pagoda. There are stalls too, selling everything from daily necessities to cosmetics and food stalls of course. The festival ends with the traditional donation ceremony for the monks on the full moon day of Pyatho. 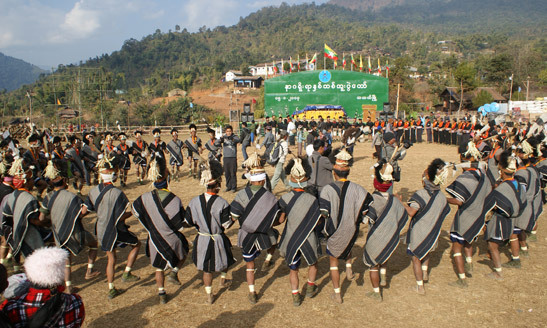 Kachin is one of the states which has a delightful festival known as Manaw, one of the largest ethnic races of Myanmar, live in the northern part of the country. The Kachin state is the roof of the country inhabited by the different Kachin races of Jainphaw, Azi, Rawang, Lashi, Mashu and Lisu. The land is swept by chill breezes blowing from the Himalayas and the streams with crystal clear and icy water of melted snow. The races dwell in villages by rivulets or in valleys or on the hill tops, each with their own language, customs and culture. 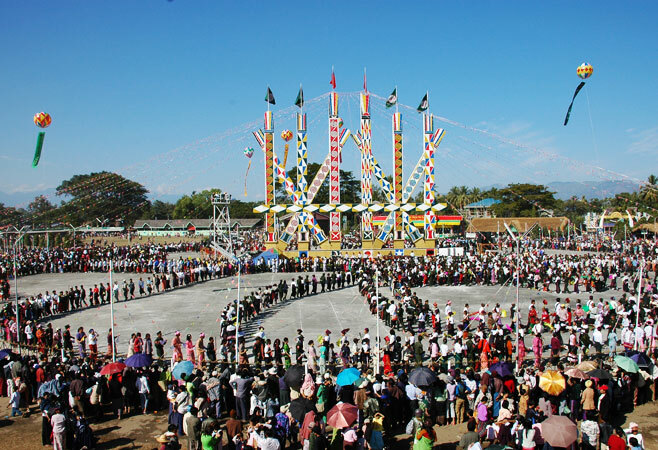 Every year in January, the Kachins hold a Manaw ( traditional commemorative festival) to welcome in the Kachin New Year. 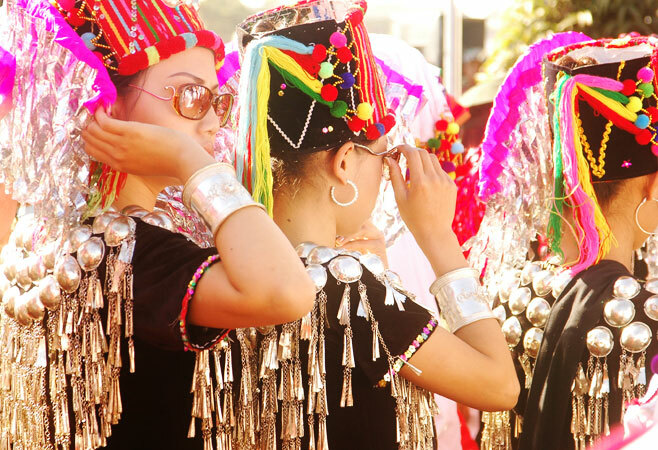 Manaw simply means “festival” in the Kachin (Jinpaw) language, and is a gathering to celebrate the harvest, New Year, or a wedding with feasting and dancing. 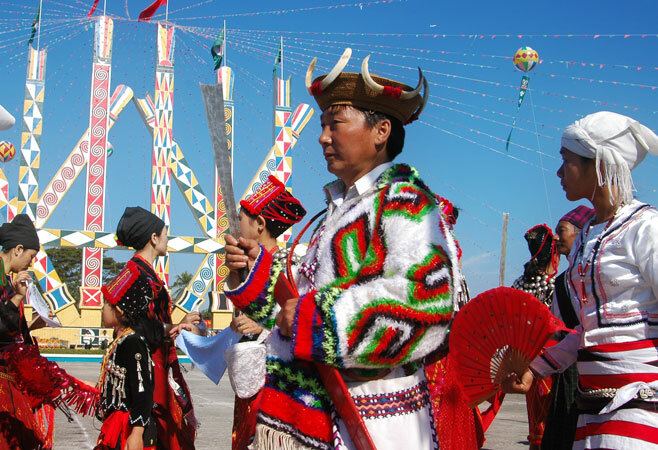 The traditional Manaw poles decorated in Kachin motifs are at the centre of the festival compound where the dancers dance around to show of gratitude to their ancestral spirits and their wish for a bright future. All the visitors are warmly welcomed to join the dance. 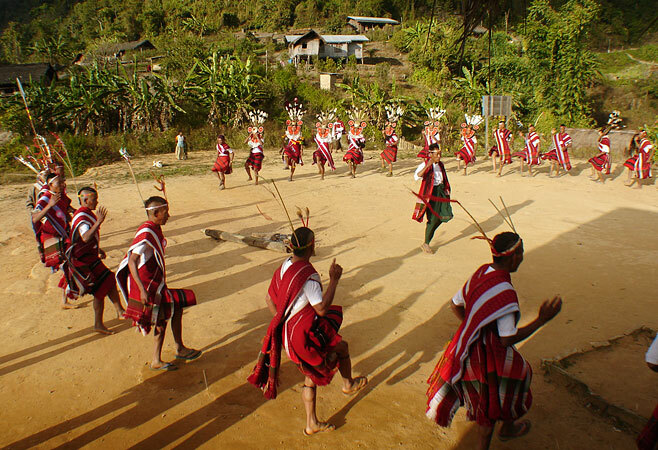 Kachin, the hill people or the Scots of Myanmar, celebrate Manaw festival. It is one of the most popular festivals in Myanmar. The festival is usually held in January. This festival has been held for more than three decades. 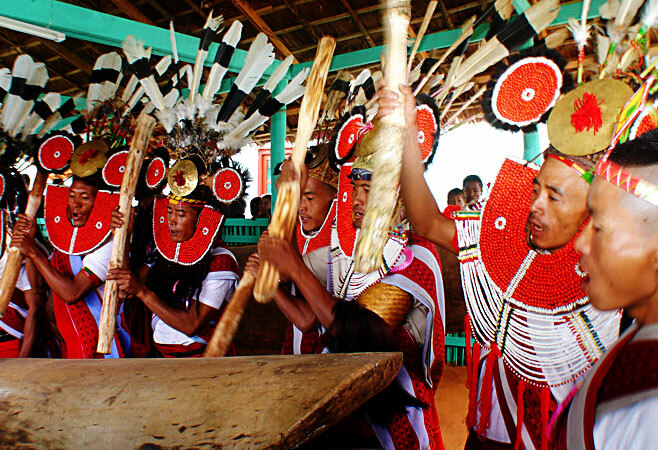 Manaw festivals is the celebration of the New Year, Victory in battles, reunion of the tribes etc. Everybody in town joins the spiritual dance lined up behind one another. The pagoda festival celebrates on 14th Waxing Moon day and 15th full moon day of Tabodwe in Mandalay. The coldest month in Myanmar and during the festival, devotees light bonfires and cook huge pans of sticky rice with ginger, coconut and sesame to offer monks at the Maha Muni pagoda. In other parts of the country, sticky rice is cooked as a celebration of the harvest and distributed within communities. Glutinous rice (which is a delicacy) contests are also held on the pagoda’s platform. 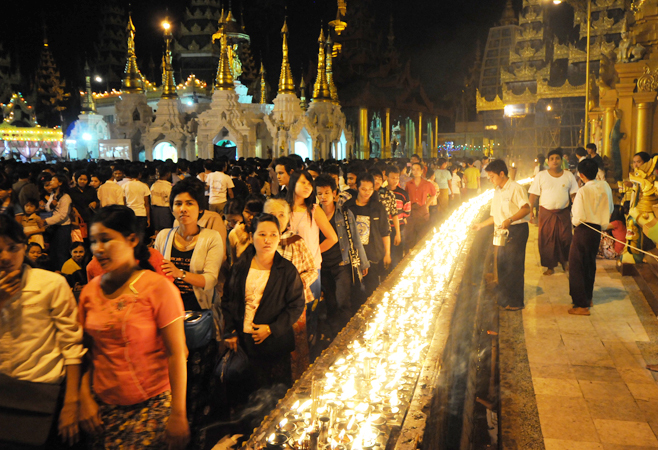 A variety of incense sticks are burnt for the Myanmar Buddha image on the full moon day. During this festival thousands of people from all over the country make the pilgrimage to the Mahamuni Pagoda. The temple is always the center of activities and during this festival it explodes with energy. Locals from far and near come to pay homage and respect to the Buddha image and enjoy the festival. Many street vendors sell, Thanakha, Myanmar made toys, Mandalay food and many more. It is very crowded in the pagoda’s compound. Well known for its extensive limestone caves over million of years ago. Shwe Oo Min cave pagoda festival is as well celebrated on full moon day of Tabaung, starts a week before full moon day. Thousands of devotees from villages around the area come to pay homeage to the images of Buddha in the cave. 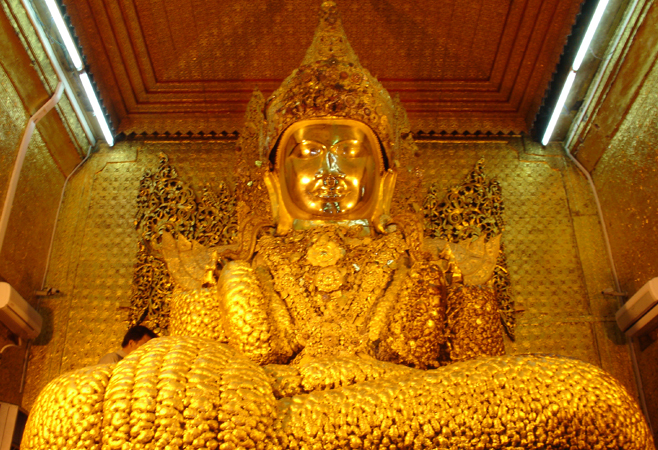 There are some 6,000 Buddha images and interesting stalagmites. Annualy, Kakku pagoda festival is also held on full moon day. The devotees come from Pa-O village to the pagoda for praying respect and enjoy the days under very huge banyan trees surrounding the pagodas. 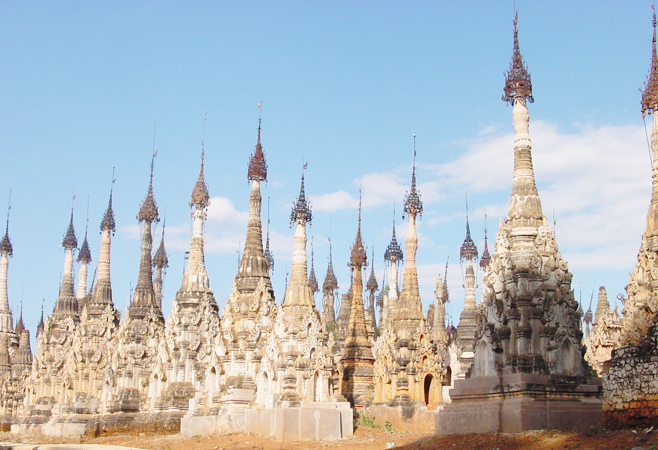 There are over 2,000 ancient pagodas in Kakku pagoda compound. The Pa-O people dress up their best costume and getting to know each other while others come by their bullock carts to the festival. 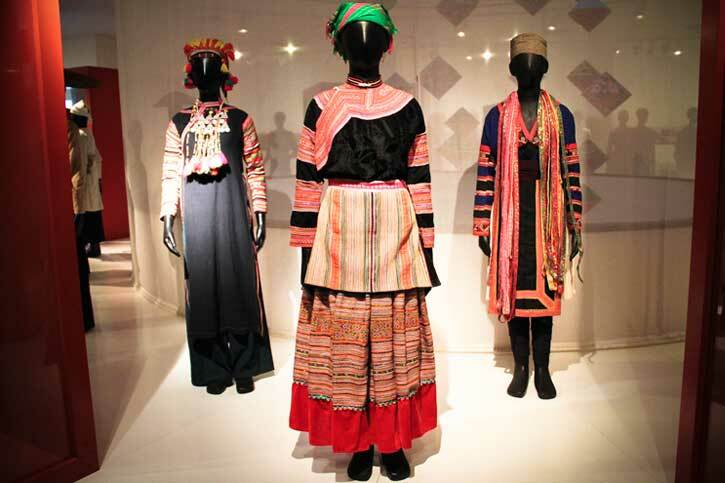 As it is, all the people of the region arrive by the thousands, dressed in their traditional costumes. Some come in bullock carts while others arrive by more modern conveyances, on the village tractor. But the most interesting time to visit this place is to get there before dawn of the full moon day of Tabaung where the Pa O people in all their finery come with gaily decorated trays bearing morning food offerings. 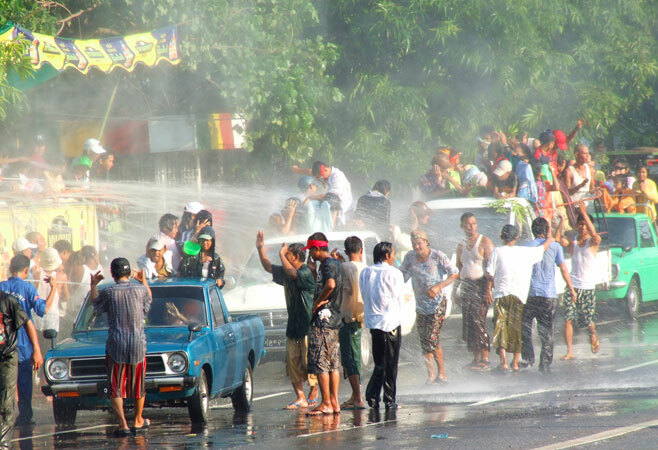 The most famous festival of Myanmar is the Thingyan Water Festival, which is held from 13 April to 16 April every year. Thiangyan water festival, the greatest and the merriest, celebrated all over the country which goes together with Myanmar New Year. It features water throwing by the way of relieving of the intense heat of the season and washing away the sins of passing year. 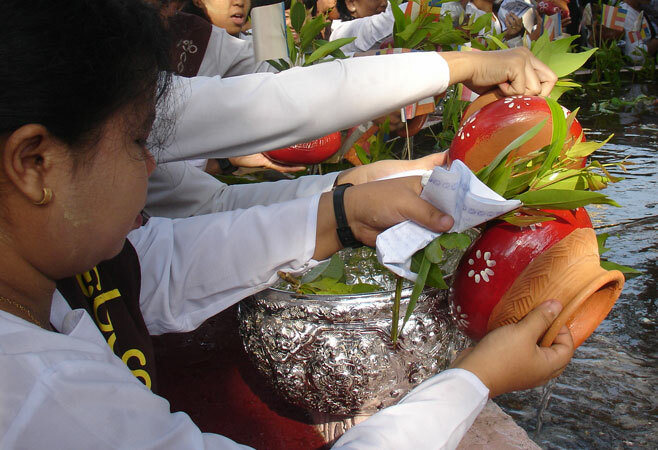 It is believed that water festival washes away sins and welcomes the New Year. The water festival represents the most popular, raucous and colorful celebration of the year for more than 120 million people who will abandon any thoughts of work and bring their nations to a standstill. People around the country gather together again and visits pagodas, offers and pay homage to the monks, play traditional games and celebrate with their joyous spirit. Young and not-so-young people have great fun throwing at one another, teasing, singing, dancing and shouting during the festival. If you take part this festival, you will feel really awesome. But Thingyan is not all for fun and play. It is also a time for performing meritorious deeds. Some do religious deeds at monasteries. As a whole, during Thingyan period everything becomes dear. After playing around and having fun throughout the country, the city-dwellers welcome the New Year on the 17th by cleaning the floors of the pagodas and monasteries, washing old and aged people’s hair, helping to cut them their nails. Some offer free food and drinks for everyone who visits the pagodas, some make other donations. If you can be here with us, you will never forget the true joy. My country’s territory has a shape of a narrow ‘S’ letter. It is in Southeast Asia on the eastern edge of the peninsula known as Indochina. Its neighbors include China to the north and Laos and Cambodia to the west. The narrowest point of Vietnam is located in Quang Binh province and it is only 40.3 kilometers wide. In English or other languages, our country’s name is spelled as one word, Vietnam. However, in Vietnamese, our original name includes two words – Viet Nam. Viet is the name of the people, which covers the 54 different ethnic groups in my country. Nam means the South. Viet Nam means the Viet people living in the South of Asia. Our flag consists of a golden star with five points to represent farmers, workers, intellectuals, youth and soldiers. The red background pays tribute to the bloodshed during the wars. We passed over 17 wars to protect our Independence during our long history. There are two famous victory against French (in First Indochina War) and American (in Vietnam War). Now, our country is one of the most peaceful countries in over the world with good foreign policies and friendly people. Our capital Hanoi celebrated the 1,000th year anniversary in 2010. In fact, the duration is over four times as many as the whole history of the USA. 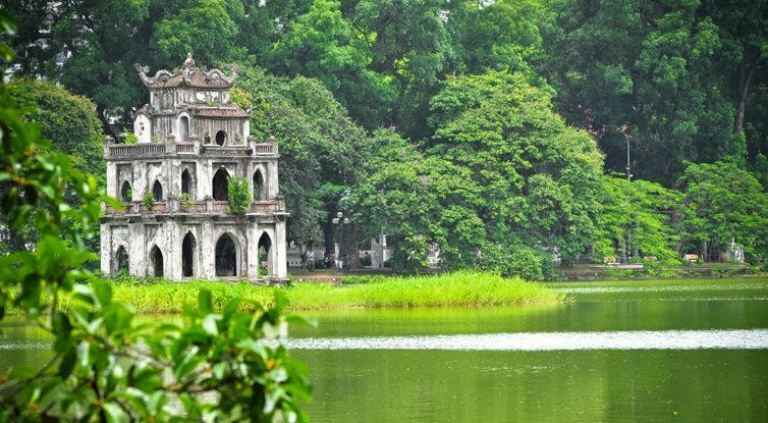 When you visit our ancient Hanoi, you will be heard about our story about a legend turtle living on Hoan Kiem Lake (Lake of Returned-Sword). In 15th century, this lake was named Hoan Kiem Lake after the legend of Emperor Le Thai To, which is somehow similar to the story of King Arthur and the Lady of the Lake’s. During the war against the Minh aggressors, King Le Thai To was given a legend Sword by the Golden Turtle God. After 10 years of continuous struggling, the King finally defeated the Chinese and reclaimed the nation’s independence. While boating on this lake, a large turtle came towards him and immediately grabbed the sword with its mouth and submerged. The king mourned the loss of such a valuable sword, yet could not find either the turtle or the sword. After that, King Le Thai To named the lake Ho Hoan Kiem or Lake of the Restore Sword after this episode. In fact, this turtle was not only on fairy story but also real and just gone in 19th January 2016. Before, scientists just found only 4 living ones in all over the world. About more than 35 million people dominating approximately 40% of all Vietnamese around the world share the same family name Nguyen. Nguyen ranks the 4th in the list of the world’s most common surnames, only after Li or Lee (with more than 120 million people), Zhang (100 million), and Wang (92.88 million). Motorbikes are the most common form of transport, and riders are fined by the police if found without a helmet. This law was passed on 1/1/2008. The lowest penalty for ‘forgetting’ your helmet is 150,000VND (nearly USD 7). Do not forgetting your helmet if you want to discover Vietnam by motorbike. It is ‘safe’ for your life and also for your travelling budget. Regarding rice, boiled rice is the most popular food in our country. It is severed in every main Vietnamese meal. However, ‘Pho’ (Noodle) is the most famous food in my country and is also the second most popular food. When cooking a pig, the entire animal is used including the blood and innards. One of our famous food made from fresh blood is ‘Tiet Canh’. You should avoid touching or taping the head of other’s head. Children may be exceptions. However, sometimes, children will still feel uncomfortable when you taping or passing their head. As some Asian country, in Vietnam, this behavior will show that you are looking down or disrespecting the older one. Moreover, we believe our head is a house of intelligence and soul and it need protecting. Please do not try to touch or tap other’s people even when you have good intention. Football is the most popular sport in my country and our rival opponent is Thailand team. After the unforgettable moment of our historical victory against Thailand in Final match of ASEAN Football Federation Cup (2008), all of Vietnamese people go out and sing national song over-night in the center of Hanoi. We celebrated for the first football cup in our sport history for a long time. Next year, our futsal team will join men’s futsal world-cup tournament for the first time. Vietnam is a country of festival with 8902 festival per year. This number includes official and unofficial festival. It may be a good potential for our tourism development. However, they was still not controlled and invested well. Vietnam is a developing country but our rate of unemployment is one of the lowest of all developing countries in the world. Besides, we are 150th member of WTO from 2006 till now. Mixed bread Vietnam’s National Geographic Magazine also (USA) voted to the list of foods most attractive streets in the world. Sandwiches or burgers Vietnam-style breads or Saigon as a kind of bread made of wheat drives conventional (and possibly rice flour). This bread comes from the French baguette bread brought into Vietnam. In the arranger, who Saigon processed into bread baguette characteristic of Saigon with a shorter length, about 30-40 cm. Loaf and further processed meat, become familiar as to become more popular dishes of Saigon. Depending on the components inside that’s sandwiched sandwiches with different names. Bread is a quick meal the morning (and evening) for international students, students and workers because there are reasonable price. Depending on each locality in Vietnam but sandwiches can be used as a substitute for breakfast, or as a quick snack at different times of the day. Banh Khot is one of the world’s most delicious food in the poll at the Street Food Festival takes place at the Singapore International Banh Khot 2013. 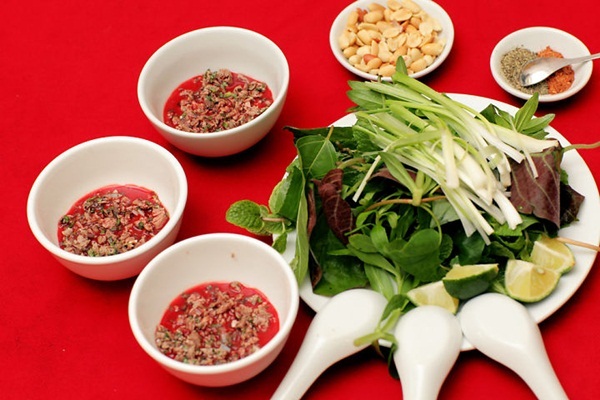 Vietnam is the cake of rice flour, there’s shrimp, fried and served with raw vegetables, fresh peppers, usually served with sweet dipping sauce, very little shrimp paste sauce (shrimp paste or fish sauce is not sour shrimp). One of the most delicious dishes Vietnam 40 CNN poll. Pancake is a cake, with yellow feature crispy outer layer of dough, inside, it’s like the price, beans, meat, shrimp in a circle and then be folded into a semicircle. Pancake often served with sauce and vegetables. Through years of development, pancakes each region are different as in the North pancakes also beans and taro root. Southern pancakes are served with sweet and sour sauce, the sauce is also Hue broth with both committing barbecue. Vegetables with pancakes is also very rich, including lettuce, broccoli, lettuce, perilla, basil, bay leaves, eating pancakes .. When people use vegetables with pancakes package then dipped into sauce to enjoy. The mix of a variety of flavors to help pancakes always taste left much to eat, it helps the pancakes become an indispensable dish on the big party in the countryside. Sticky rice wrapped outer shell banana coconut milk has been mixed up when baked up crispy and delicious eating fat. Not only is this dish baked banana chan up fragrant coconut milk, along with roasted sesame rustic delicacies made this southern favorite at Congress Street Food (World Congress Street food) organization 05 in Singapore at the end of last month. Situated at the beginning of Hang Trong Street, noodle shop is only open from 5 pm until 8 pm is more range out of stock. More than two dozen low plastic chairs, the old-fashioned bowl bowl, put a pot of water heated over charcoal, boiled meat dozen bags and a basket of noodles, furniture shops have only so simple. Regular patrons for years to eat so few people remember the bartender asked and only referred to as “noodle shop undiminished”. Unique names that have since become sticky food “identity” of the shop: customers a bowls, chopsticks other hand blow hup collapse, though bowl with hot hands, it still must … undiminished. 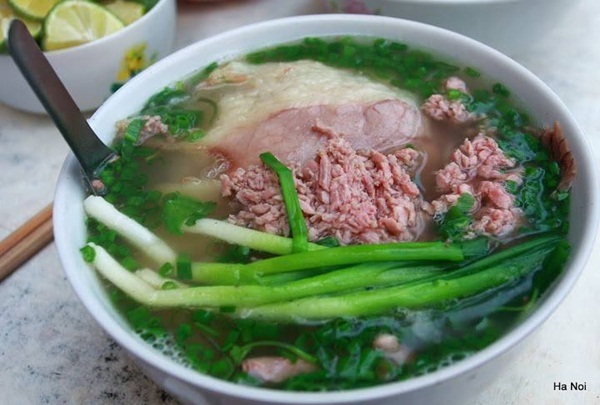 Not many choices such as beef, chicken, noodle wine sauce … “trap” the only true type Hanoi pho as writer Nguyen Tuan wrote, beef noodle soup is cooked enough pieces encrusted with crispy, fatty piece bucket, bread smooth chewy noodles, chopped green onions and scallions. This weekend afternoon prone to addiction clients ate two bowls of pho sitting coloring. Photocopies of your passport. You should keep your original passport in safety box at your room and just bring passport photocopies for outside activities. Zip lock bags. They are cheap, disposable, and keep all kinds of things fresh and dry. Also, should keep eyes on your belongings at crowded areas and kindly do not bring valuable things or too much cash outside. 3. 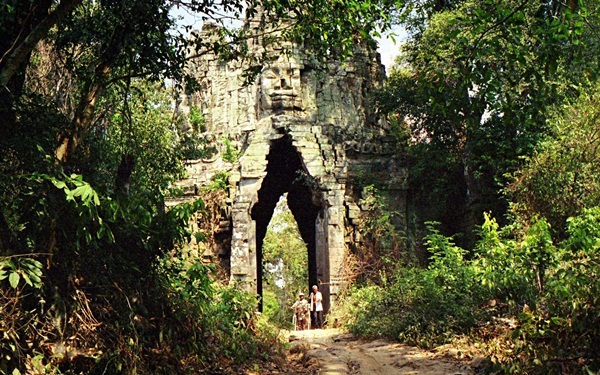 Tipping When visiting outdoor temples, including those of Angkor Wat, shorts and T-shirts are acceptable. Shoes and hats are generally removed at the entrance to pagodas. 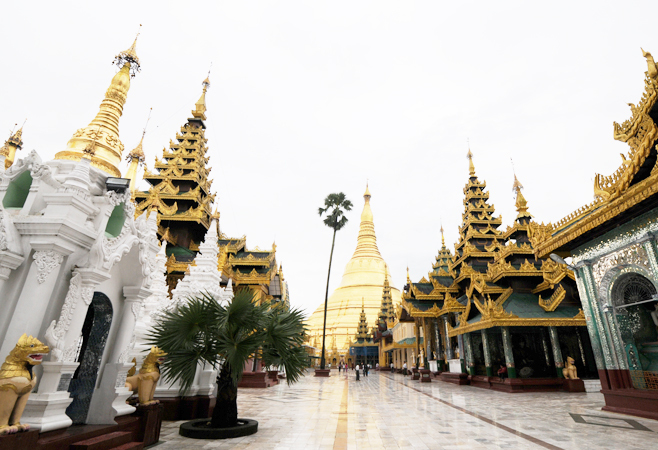 For visits to the Silver Pagoda, which is within the Royal Palace grounds. visitors are asked to dress more formally. Gentlemen are required to wear long trousers and ladies should wear long trousers or long skirts and keep their shoulders covered. Bell Captain: US$0.5 – US$1 per luggage up/down. Taxi driver: US$0.5 or round up the payment. If it is a long journey, then tip like driver. The suggested amount bases on my experience in travel industry and some online references.